The railroad alignment along the Potomac from Big Pool to Cumberland has been converted into a "rail trail." 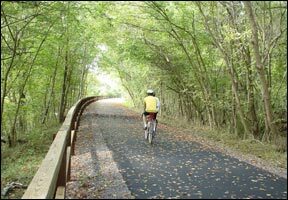 The Western Maryland Rail Trail is a paved, multi-use trail that follows the old Western Maryland Railroad along the Potomac. The Western Maryland Railroad built a popular section of track from Hagerstown to Big Pool, then extended it to Cumberland in the early 1900s. By 1906, the Western Maryland reached Cumberland. In 1990, the Maryland Department of Natural Resources acquired the abandoned section of the Western Maryland Railway and began planning a 20-mile trail through rolling farmland, towns, and woodlands. Today, the trail extends from the trailhead at Big Pool to Hancock, with a 10-mile extension beyond Hancock that was completed in 2002. Parking is available at either end of the trial (Big Pool and Hancock). This is a paved alternative to the C&O Canal towpath, popular among cyclists and rollerbladers. Combined with the towpath, the Western Maryland Rail Trail can provide a 40-mile loop trail. A proposed 4.5 mile extension of the trail would take it to Little Oreleas, Md., with access through a 4,400-foot tunnel.